"Because there are lots of oil-mist and dusts on the production site, an ordinary PC breaks down as soon as it is installed." Business need: If a PC is used on a production site that has lots of oil mist and oscillation, it will easily break down. 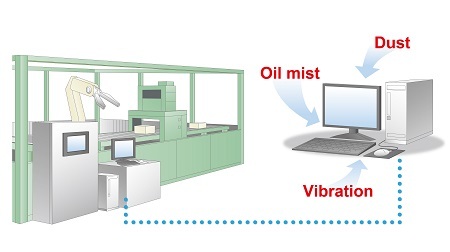 Due to production lines for processing metal components, the environment has lots of oil mist and dusts. 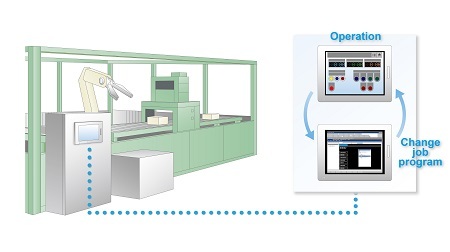 Since robots are installed in some production lines, PCs are accordingly installed to rewrite the JOB programs. 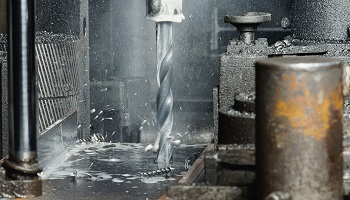 But the installed PCs are affected by oil mist or dusts and easily break down. There's no other place to install a PC on, so every time a PC breaks down, it takes time and effort to replace it with a new one. "Pro-face brought us a groundbreaking idea ahead of any other manufacturer. This small unit is a magical box that can attain networking of even 20-year-old devices." Because commercially available PCs are not designed to endure in a tough environment, they are easily affected by oil mist or dusts. The Pro-face's industrial HMI, SP5000 Series has high resistance to environment and applications that handle programs to change JOB of robots can run on it. Needless to say, it can control PLCs and robots as a usual HMI, so you don't have to worry about installation space.